As much as we love the hi-fi industry, it’s not one that often shocks or surprises in terms of design. The last time it really did could well be way back when the now iconic B&W Zeppelin first appeared. It’s possible that the Marantz Consolette is similarly destined for legendary status – certainly the company will hope so – but while the Zeppelin was almost universally loved, this new unit is a little more ‘Marmite’ in nature. To some it’s a striking blend of materials and shapes, to others it looks as though a lovely curved speaker has been smooshed onto a micro hi-fi with awkward, incongruous results. The best art provokes debate, though, so perhaps this Marantz Consolette really is a future classic. One thing’s for sure, though – the Marantz Consolette is much bigger than it looks in pictures, and will require a shelf of reasonable depth if that’s where you choose to put it. It’s extremely well built, too, with metal construction for the front panel and controls and beautiful, curved walnut on the back. The now traditional porthole display adds an extra element of individuality to the look, even if its small size and the sluggishness of the scrolling text within it means it’s not hugely practical when it comes to actually giving you information. The scroll wheel to the right of the display, used for navigating menus and adjusting volume, is another nice touch that’s not quite implemented as well as it could be – it’s got a looseness that makes finding the right tracks and items a little imprecise. Thankfully you can ignore the scroll wheel and use the beautifully machined, minimalist remote control instead. Or take a step further up the ladder and opt to control the Consolette using the dedicated app. This is by far the nicest way to control the Consolette. Not only does it give you quick access to all of the device’s sources, it makes it infinitely easier to browse and search the internet radio and the music libraries on your network or a connected USB storage device. It’s not perfect, mind you. Setting the Consolette up using the app was a real pain, especially when compared to the terrifically simple connection setups offered by the likes of Libratone these days. It presented our album artwork in rather ugly, pixelated form, too, and the handy queuing and favourites features of the Denon app for the CEOL Piccolo (among other products) are sadly missing. Still, this is software that can be improved relatively easily and we’ve already seen updates pushed through since we started testing, so with any luck it won’t be long before Marantz makes the Consolette app as great as it is indispensible. So that’s what the Marantz Consolette looks and feels like out of the way, but what does it actually do? At its heart, this is an AirPlay speaker with premium credentials, but it’s also got a raft of extra features up its sleeve, including DLNA tech for playing your own tracks across your network, an internet radio, and even a physical iDevice dock (30-pin, although Apple Lightning adapters are compatible) that hides away in the design rather beautifully. Take that, B&W A7. The thing is, while those are certainly added bonuses over a strict AirPlay-only unit such as the Bowers & Wilkins range-topper, they don’t go quite as far as they might. High resolution music isn’t supported across your network, and while the DLNA function does mean Android users can send the music stored on their phone to the Consolette, it doesn’t help those users send music from apps such as Spotify. 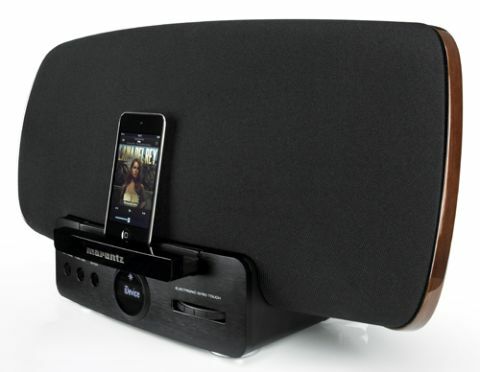 Had Marantz included Bluetooth as well as AirPlay, or perhaps built Spotify into the device itself, there would be a compelling reason for Android users or those without a smartphone to jump on board, but as it is the Consolette is clearly geared towards iPhone, iPad and iPod Touch owners. Not that there’s anything wrong with prioritising Apple, of course – the B&W A7 doesn’t even nod towards anything without an Apple logo on it – we’re just pointing out who the Consolette is really for. So you’ve got your iDevice, you’ve downloaded the free Marantz Consolette app, you’ve gone through the hit-and-miss network setup and you’re ready to go. Start by sending an Apple Lossless rip of Ed Harcourt’s The Cusp & The Wane via AirPlay and the sound that emerges is simply beautiful. Both the vocals and piano are projected with all the clarity, detail and nuance to reveal all of the honesty in the recording. Switch to a We No Who U R by Nick Cave & The Bad Seeds from a NAS device and the good times continue to roll. There’s real width to the soundstage and a degree of stereo separation rarely heard in an all-in-one unit such as this. Again, the clarity and detail in the soothingly delivered vocals is superb, the synthy keyboards twinkle prettily, and the simple bassline is deep and smooth, just as it should be. It goes superbly loud, too, and will fill a big room far better than its closest rivals. My Number by Foals does present some issues, though. All is as it should be as the track opens, with the drums, bass and vocals each occupying their own space in the soundstage, but when the chorus hits it doesn’t do so with as much force as you might expect, with each note (especially in the bassier frequencies) missing just a little punch. As the number of instruments and vocal strands increases, this slight lack of attack and rhythmic precision means the Marantz starts to lose some of its control over the presentation. The more instruments and layers a track has, the more the Marantz Consolette struggles. If you’re a fan of metal, for example, you’re going to find it hard to make sense of some of the heavier moments, even if the more simple, more melodic sections still sound pretty fantastic, which is exactly the experience we had when we sent Letlive’s The Sick, Sick, 6.8 Billion from Spotify on an iPhone. None of this should lead you to rule out the Marantz Consolette. It’s got more features than its closest rivals and those whose musical taste tends to lean towards simple ensembles – whether they be acoustic, electronic or poppy in nature – will find the Marantz a really engaging and rewarding listen. It’s just that more complex compositions – again, genre non-specific – aren’t as well marshalled or cleanly delivered as they could be. Our advice? Take some of your favourite tracks to the shop and try it out. Apart from anything else, the Consolette’s physical design really demands to be examined in the flesh.